Hey guys and welcome to another Get To Know Me post! I do these sporadically on Sundays to divulge some stuff about my life aside from books and share things from what I'm up to when I'm not blogging. This time, I'd like to tell you about my trip to Belgium that I got back from last Monday. There are A LOT of pictures, so I'm sorry if the post loads a bit slowly for some of you! Why did I go to Belgium, you may ask? Well, to keep it short - my best friend fell in love and moved there to be with her boyfriend in Kontich, a small town near Antwerpen. I miss her. She wanted me to visit. I was more than okay with that. Flights with Easyjet are very cheap and only take an hour from Basel to Brussels - there you go. I flew in Thursday evening and my friend and the BF got me in Brussels with his car. Back in Kontich, we stayed in at their apartment, cooked, and watched the last two episodes of Game of Thrones, season 2. Who doesn't like wildfire and dragons? The heap at the bottom is the pillows on my mattress. My friend is as book crazy as I am, so now the study is also the book room. Another cool thing in their apartment? They have a shelf in the mini-bathroom that is comics and manga only. My inner nerd approves. Anyway, on Friday, we got up sort-of-early and took the train to Antwerpen. It's a very beautiful city! We did some sightseeing and shopping and later met with a friend of theirs for coffee. It was a lot of fun! There was also a used books store and a comic and manga nerd-store (also English ones!) involved ;) See? This life-size spiderman is on the outside wall of the store. They had a bit of everything. You guys, I could've bought so many mangas that I usually have to order from the internet >.< But I restrained myself. Instead, I bought Neil Gaiman's Death - The High Cost of Living, a companion to his Sandman graphic novel series that I'd been looking for for a long time! Silly me forgot it my StS post from yesterday, so I'll add it next week. Here are some more impressions. If I know what the buildings are, I'm adding it to the captions. Click the pics to make them bigger. This one and the next 3 pictures are from inside the railway station. It was so beautiful!! This one is from inside what used to be an 18th century ballroom and was now restored in its gilded glory and turned into an upscale mall. Traditional shop front behind the cathedral. There are lots of red brick buidings in Belgium, and I love it! There aren't many of those in Switzerland. It reminded me of England. After lunch (sushi, myum) and meeting up with my BFF's friend, we headed for the river and the docks and made our way over to the MAS - Museum aan de Strom, which means museum on the river. If you want to see it from afar or read more about it, you can do that here. It's a nine storey art museum and we went up all the way on escalators, which took a while. The view was amazing though! Twilight was just starting to fall and you could see all over the city and the river. By the time we were done taking pictures and goofing around, it had grown really cold. Coffee was in order. And a quick trip to the book store before it closed. That evening, we were really beat from all the walking, but we still decided to meet up with the boyfriend's friends in the neighboring town of Duffel (not pronounced like the duffel in duffel bag) for the traditional Christmas tree burning. Yup, everyone brings their trees to the town square, where they're lit on fire at night. It was cold, but really fun! Thankfully, the BF's friends also spoke English. I understand some Dutch (it's like a mixture of English and Swiss German) but not when several people are talking at once and a band is playing. The second cover band was really awesome and played all these songs from the 80s that everyone can just sing along to. It was so much fun! People were friendly and outgoing, we started dancing, and suddenly I found myself in a huge Polognese that trampled all over the square. We went home around midnight, stinking of woodsmoke from the fires. The next day, we had planned to go to Ghent but the weather wasn't so awesome and we were lazy, so we stayed in. I watched my friends play the Lego Marvel Heroes and Lord of the Rings games on Playstation, read a bit, watched Iron Man... it was nice. We went to bed early-ish because we had to get up early to drive 1.5 hours to Bruges on Sunday morning. Have you ever seen the movie In Bruges? If not, you should!! It's fun (if you get dark humor), and sad, and just... crazy. It also has the highest frequency of F-bombs (usually at least one per sentence) I've ever heard used in a film, just to warn you if you've got a problem with that. But yeah. It's a lovely medieval town with beautiful buildings, shops, and awesome chocolate! Here are some impressions. Lots of people took tours of the town with carriages. If you've seen the movie - yes, this is that tower! I love that there's a compass / clock on top of this building! This sugary colorful cones are a Belgian specialty. Allegedly, they have Jesus' blood in there. We didn't go in to check. The façade is very beautiful though! I meant to take a picture of the flowers for my dad, but ended up loving the reflection on the water! Bruges is also famous for its lace shops. The beautiful Queen Astrid Park. Lots of houses had the year of their being built written somewhere. I love that spider web window! This tiny Döner kebab shop stood amidst more modern buildings so I just had to take a pic. All in all, it was a wonderful trip and Bruges was a beautiful conclusion! Early the next morning, it was back to the airport for me and then off to work for my friends. At 10:15am, I landed back in Basel and a good 2 hours later I was in my Zurich apartment. Here's a map so you can see where I was. 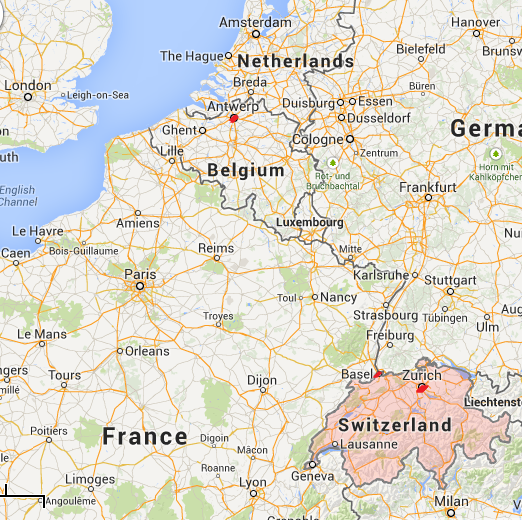 The first one is of the bigger context (where is Belgium in relation to Switzerland), the second is within Belgium. I live in Zurich, flew from Basel, and stayed near Antwerpen. I landed in Brussel, stayed in Kontich near Antwerpen. 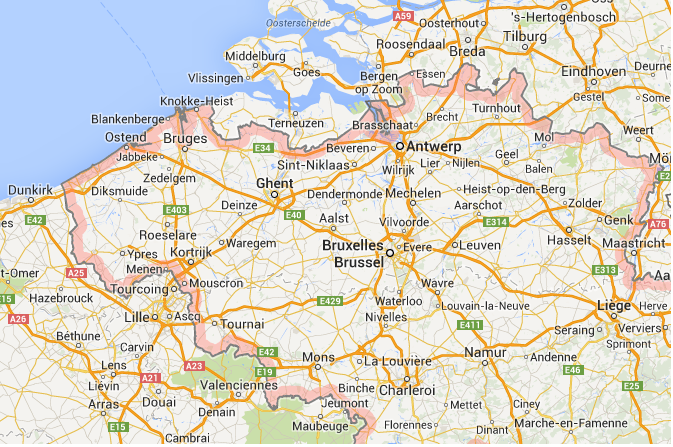 Bruges is more to the left/east near the coast. Alright, this is it :) Took me about 90mins to write this post, haha. It was great to see my BFF and her boyfriend again and see where she's living and working now! It also felt awesome to just get away from home and work and everything for a few days and see new things, meet new people, hear a new language. I hope this was interesting for you guys as well, and that you liked the pictures! If you did, it'd be lovely if you left a comment. I also have pictures from Prague, Florence, Hamburg, Amsterdam, Budapest... but I feel a bit silly sharing them if no one actually cares to see them. Do you ever take short trips? If so, what do you go see? ^^ Did you try the cuberdons? which taste was your favourite? To be honest, they're a bit too sugary for me ^^'' I stuck with the chocolate, which was fantastic! So many different flavors and fillings! Oh, Brussels <3, I've visited it years ago (in high school), but I remember the cathedral and the yummy pralines. oh and the flower market! Even bought some tulip bulbs. I didn't see much of Brussel apart from the airport, but I want to check it out another time :) And I can really recommend Bruges! It was very beautiful. It's not the season for flowers now, but I also bought some tulip bulbs on the market when I went to Amsterdam in the summer of 2012! Next: I would have wasted AGES at the book/comic/nerd store hehehe! Like, for real you would have left me there...loved that Spider-Man on the wall!! And the inside made me drool. Right? It's so prettily organized ^^ She also has floating shelves in the bedroom, but it felt invasive to take pics there so I didn't. We did waste at least an hour so in the nerd store ;) It didn't just have awesome stuff, it was also a beautiful old house with wooden stairs and a gallery upstairs! The Christmas tree burning was something else! But yeah, it was cold, that's why we started dancing :P But definitely not up-in-the-Swiss-mountains cold or Canada cold! I hear you get more than -30°C sometimes!! I don't eat a lot of chocolate either (I know, shocking for a Swiss person) but I made an exception and it was soooo good!